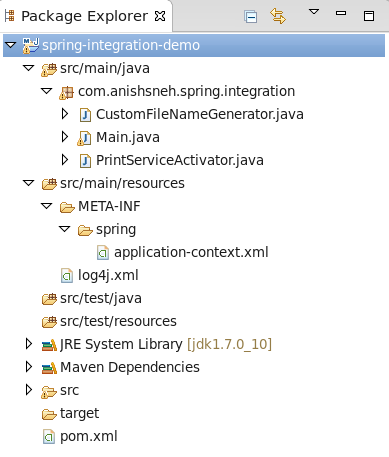 As explained in previous post Spring Integration application can run inside any spring application container. It may be a web application (loading context via web.xml) or a standalone application (loading context via ClassPathXmlApplicationContext.class). We will start with a quick file watcher example in which we will implement a file adaptor which will process incoming files asynchronously. Note that the complete flow is event driven (internally) i.e. when something happens at one stage it triggers the next step and so on till the flow ends. All of the events are triggered with some payload termed as message in Spring Integration. Also in the flow output of one step is used as input by the next step (and so on), which evolves in the form of a pipeline processing. Great post..!! !Helped me in understanding spring integration.